Reconciliation is one of the most important matters facing the Australian community. This edition of the Research in Practice Series aims to support early years practitioners in exploring reconciliation with young children. Starting with insights into the history of reconciliation in Australia, the book provides ideas for reflection and action towards a reconciled Australia. The context and history are brought to life through the voices of a range of early childhood professionals working in the sector, and their stories offer concrete, accessible and meaningful examples of action, which other educators may find useful in developing their own framework for reconciliation work. 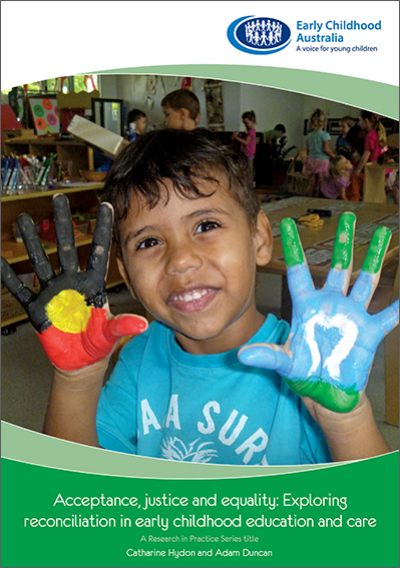 This book forms part of Early Childhood Australia’s ongoing commitment to reconciliation. It is hoped that the ideas and stories provided in this book will drive a revised determination in those who see this work as decisively in the domain of early childhood education and care. This book aims to provide early years practitioners with a strong introduction into the exploration of reconciliation with young children, and in being a launching pad for embedded practice. Starting with insights into the history of reconciliation in Australia and well-articulated aspirations for a future shaped by positive relationships, this book invites everyone to join in the unfinished business of this nation. Not only are these ideas a foundation for reflection and action towards a reconciled Australia, but it is also hoped that these ideas and stories will drive a revised determination in those who see this work as decisively in the domain of early childhood education and care. The context and history of reconciliation are brought to life through the voices of a range of early childhood professionals working in the sector. It is through their dedication towards reconciliation work with young children that we begin to understand what it means to embed justice and equality into education for young children. These stories offer concrete, accessible and meaningful examples of action, which other educators may find useful in developing their own framework for reconciliation work. The book also recognises the important work of Reconciliation Australia’s program, Narragunnawali: Reconciliation in Schools and Early Learning, as a powerful way to formalise the reconciliation journey.